I found a neat little gem on Amazon Marketplace. Limited edition: Two Hardcovers in slipcase. 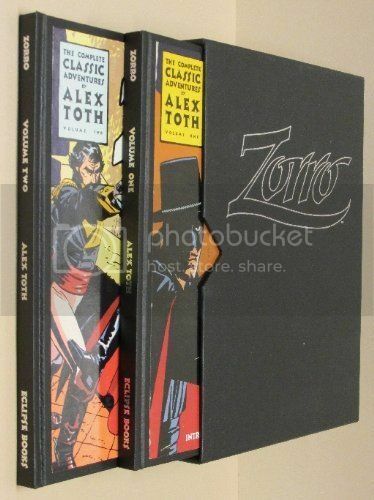 Vol 1 signed by Alex Toth on bookplate. #141 of 350. Perfect condition. Amazon Marketplace: $7.81 plus $3.99 shipping. Re: I found a neat little gem on Amazon Marketplace. Wow! What a great price for an awesome set! Wow, I assume they only had one? Was it advertised that way? Steep price for shipping when it's more than half the cost of the item. You lucky dog. That is an awesome find. Yes, only one. The seller was a comic book shop. Yes, the description was exactly as quoted. This set was published in 1988. 27 years old, and it doesn't appear to have ever been read. It's absolutely flawless. Alex Toth was a brilliant, brilliant artist and character designer. He's a big reason why the Super Friends became stuck in the public consciousness. That's an incredible deal you got, which is rarer on a place like Amazon. I've often been tempted to scour the details of every used listing of books like this on Amazon, hoping for such a gem, but figured it'd just be a windmill. I just checked ebay and it's going for around $30 -$50. So, you obviously got a nice deal! Last edited by mrhan; 05-25-15 at 10:11 AM. So... does this particular Marketplace have anything else? Wasn't he also behind mid-sixties Hanna-Barbera stuff like Space Ghost, Birdman, Herculoids, Mitor, etc. Nice score SO. I would have been all over that if I'd known about it. Toth is absolutely my favorite comic book artist/storyteller and has been since the late 80's ever since I considered a career in the field. While I'm not as fond of the Zorro stuff as I am for most of his other work, I would still rate it higher than 95% of what's out there. He never fails to entertain, or tell a story well. And there is still plenty there that aspiring comic book artists could pick up if they study it. For long time, it was one of the only collections you could readily find of his work which made it a premium go-to book if you were trying to study him. 25+ years later there's a wealth of good material, well presented, out there now led by the massive three volume IDW biography/monograph along with all of his trendsetting work for Standard Comics in the 50's from FB. Supposedly IDW is also planning a deluxe release of Bravo For Adventure, which was a labor of love for him and first collected by Dragon Lady Press in the late 80's. It's a great graphic novel with an aviator hero clearly modeled (visually) after Erroll Flynn. It's also got some of the best sequential panel layout/composition I've ever read. Not a real surprise coming from Toth, but even then I would rate it as some of his best work. Definitely something to keep an eye out for. And yes rw2516, Toth created thousands of pages of model sheets while at H-B. His was the prime hand in setting a visual standard for most of their output. I still have a bit of regret selling my signed Spirit Archives I picked up for a great price from a Dynamite Comics website daily deal many years back, so if I was SkullOrchard I would stick this puppy on my bookshelf and not eBay it.